Using a 12 inch, oven-safe skillet, preheat over medium high. Add the oil. Season the chicken, both sides, with your spices, and salt/pepper if desired. When the oil begins to shimmer, carefully lay the chicken in the skillet, skin-side down. Let the the skin get browned. Do not turn them, or even move them to get the best results. This will take 6-7 minutes. 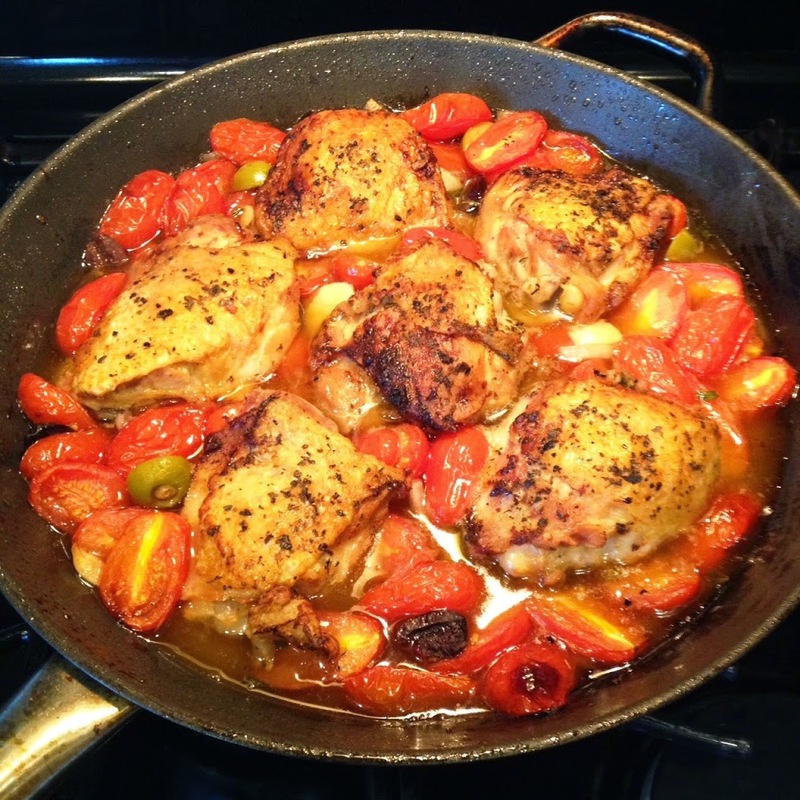 While the chicken thighs sear and brown, slice the garlic, dice the onion, and halve the tomatoes and olives. After 6-7 minutes, remove the chicken to a plate and set aside. 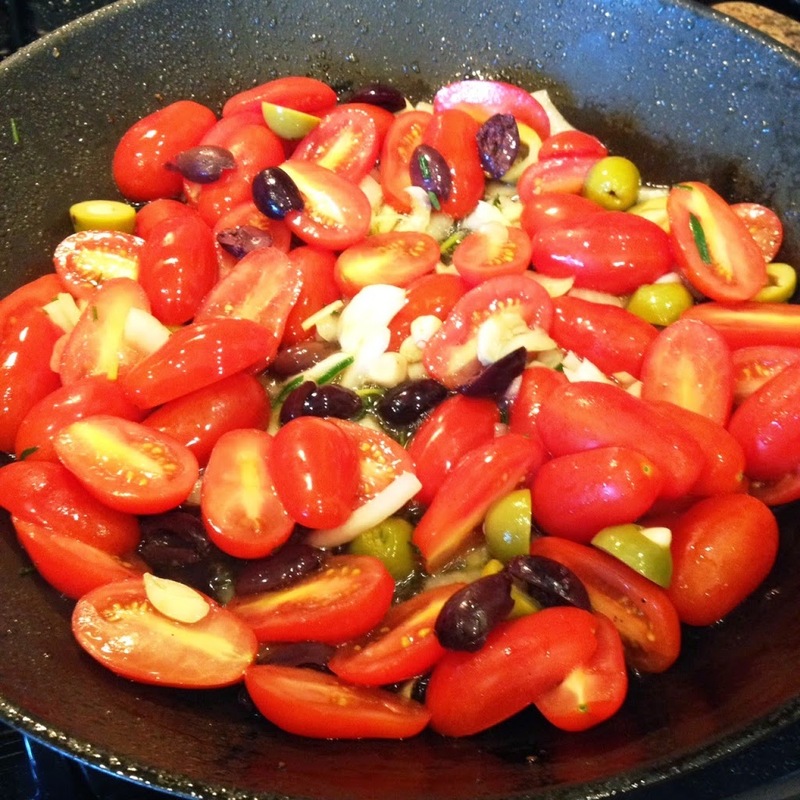 With all cooking juices still in the skillet, add the garlic and onion, then the tomatoes and olives. Carefully return the chicken to skillet, skin side up. 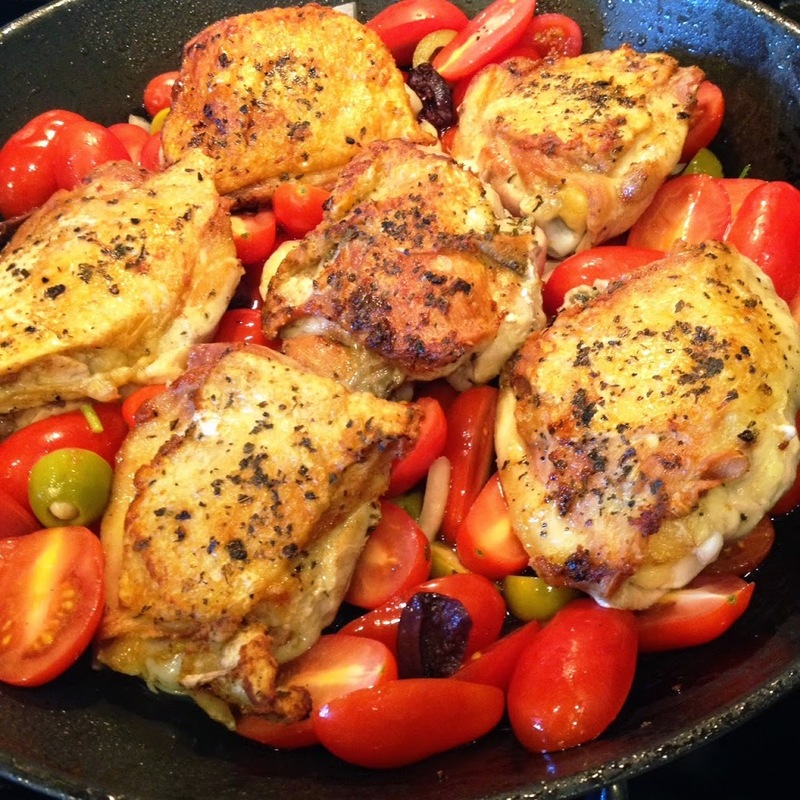 Place skillet in oven, uncovered, for 30 minutes, or when the internal temperature of the chicken is 165F. You could certainly serve this on a pasta, such as angel hair or linguini. This is an easy meal, that will be ready to eat about 45 minutes after you put the potatoes in the oven. Meals like this are healthy, easy, inexpensive (especially if you buy frozen fish when it is on sale) and are convenient as the potatoes and fish cook at the same temp, at the same time. Using bagged baby spinach makes this quick. 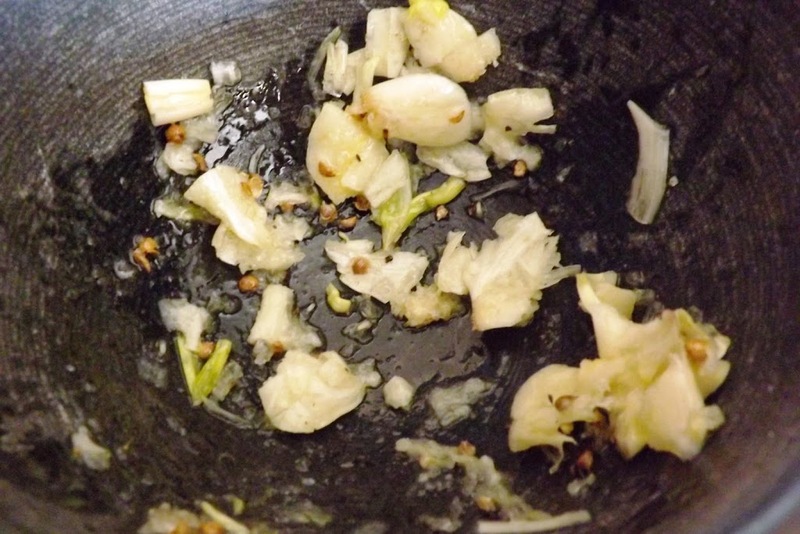 Just don’t use pre-chopped garlic from a jar. That tends to be old and bitter. We talk about planning ahead and making good choices like this on my Make Your Someday Today podcast. When you take the little time to make plans in advance, you are able to save more time, live healtier, lose weight and save money! What a great combination! 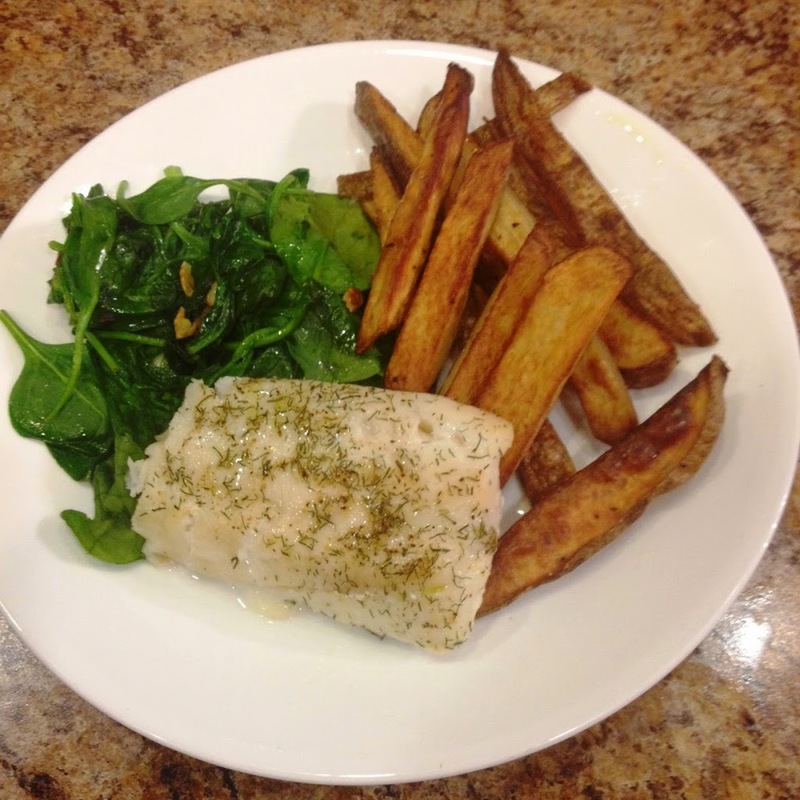 You can make this with any white fish (cod, haddock, pollack, flounder are all good choices.) In general, place the fresh (or thawed) fish in an oven safe pan, drizzle a hint of olive and then sprinkle dill, salt and pepper as needed. (Garlic or onion powder are also good options. Another excellent option is Penzey’s Sunny Spain.) 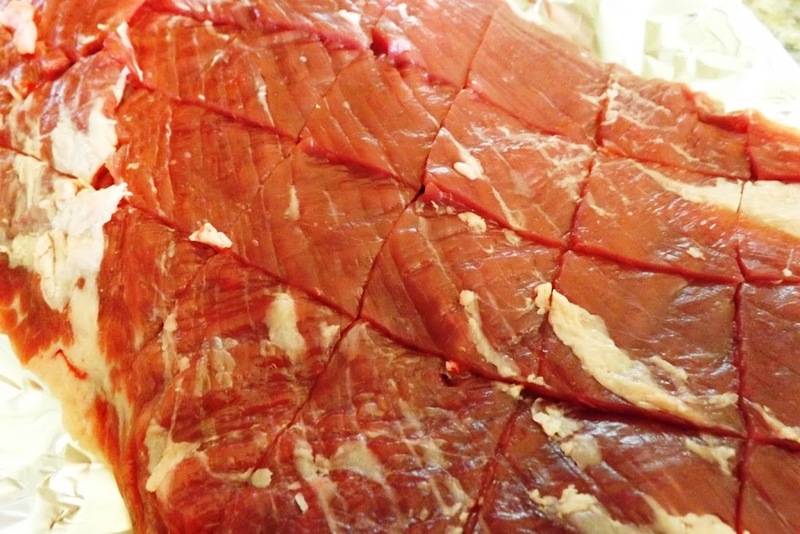 Bake at 450 for 8-12 minutes, dependingon thickness of the fillets. The fish is done when it begins to flake it you lift an edge with a knife. Serves 2-4, depending on how much everyone likes spinach. In our case, this made three servings. Prepare all ingredients, but don’t start cooking this until the fish and potatoes are done. This only takes about 4 minutes once the pan is hot. Heat your non-stick skillet (large, 11-12 inches). Add olive oil. Add half the spinach, tossing frequently for 1 minute. It will begin to wilt. With skins on, cut potatoes into 1/2″ thick fries. Place in bowl. Drizzle oil, toss and season as desired. Place on baking pan and bake for 40-45 minutes. Turn and toss every 15 minutes. After 30 minutes, place the pan with fish in the oven. The fish and fries will finish at about the same time. When the fish is done, remove from oven and cover with foil to keep warm. Do not cover the fries or they with steam and get soft/soggy. When done, they should be brown and crisp. 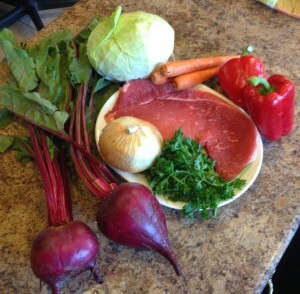 Some people and cookbooks call this “borscht”. 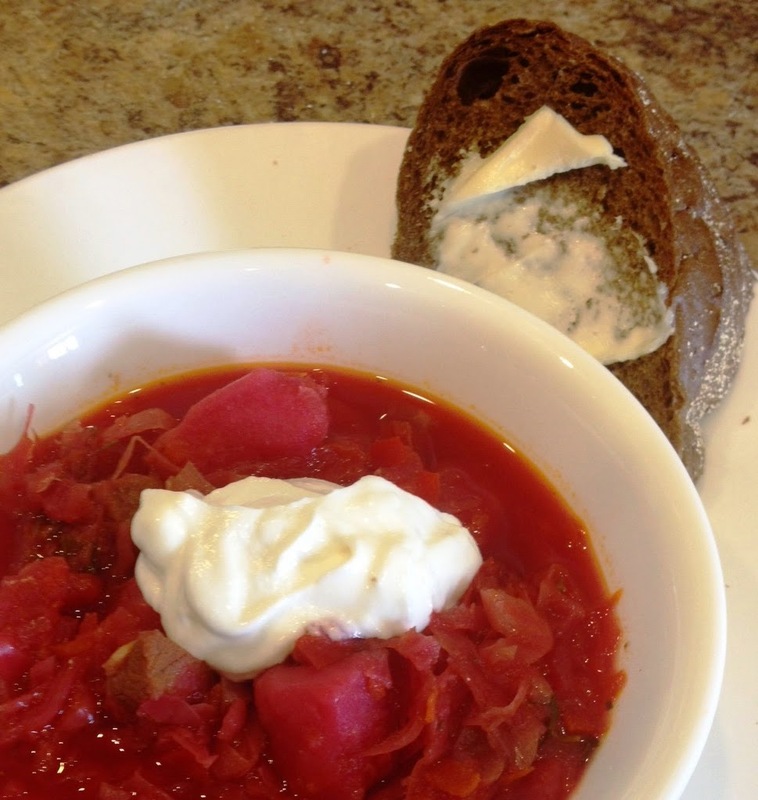 My Ukrainian-born friend who gave me this recipe says that it is supposed to be “borsh.” She was a Captain in the Israeli Defense Forces, and is a fierce woman. Who am I to question her? sour cream and fresh chives for garnish. Put the meat in a big pot. Add beer, garlic, black pepper and 2 cups water. Bring to boil, cover and lower the heat to a medium flame and allow to cook for 1 hour. Add the beets, carrots, onion, potatoes and salt (optional). Add 1 cup boiling water if needed to cover. Add the tomato paste, cabbage and peppers. Stir to combine. Bring to a boil and allow to cook for 15 minutes. Add the sugar and parsley. The parsley is NOT for garnish. It is necessary to complete the flavor profile. Cook on a medium flame for another 20 minutes. 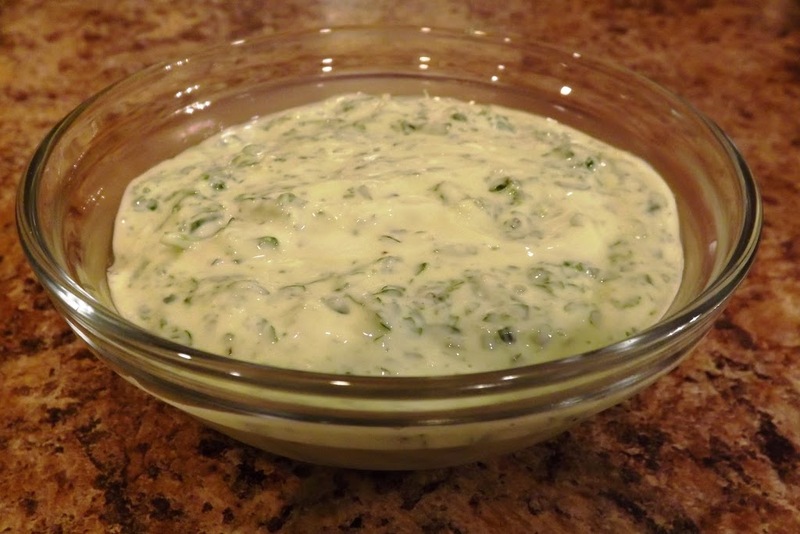 When serving, reheat over medium, and serve with a tablespoon sour cream and freshly chopped chives. Do me a big favor? 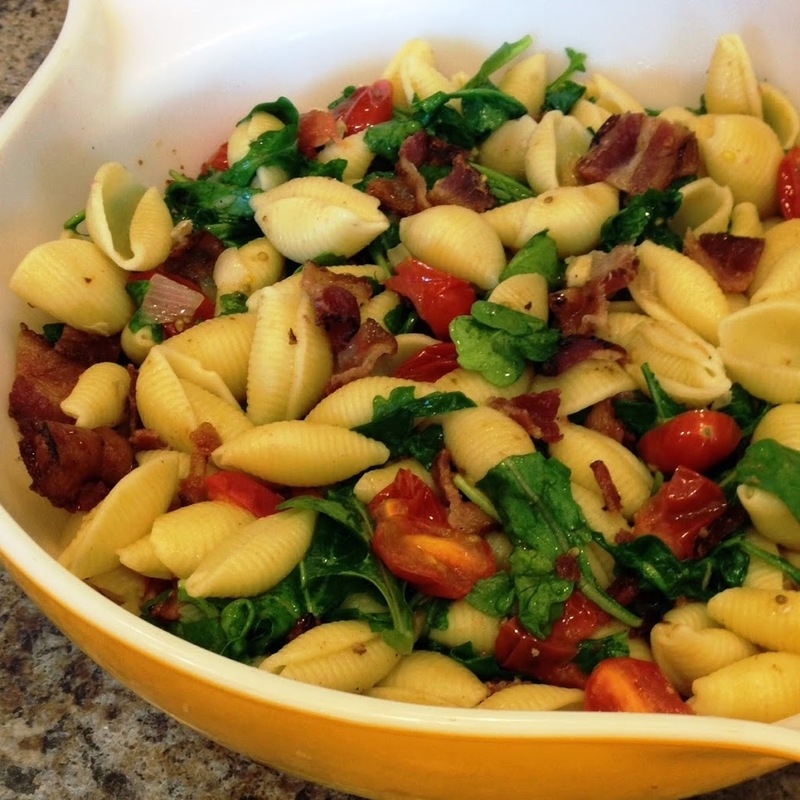 Please leave a comment here for Julie and her recipe and tell us when you have or will make it! 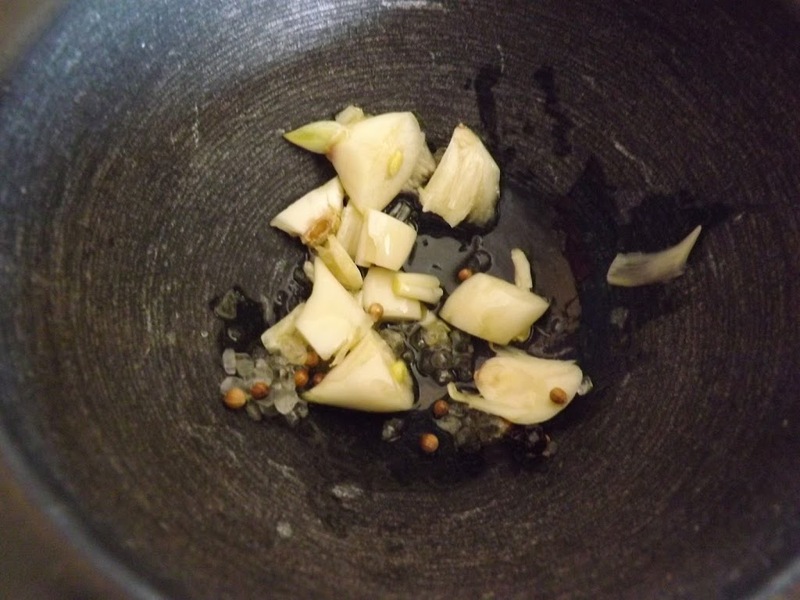 While pasta boils, saute mashed garlic in olive oil until fragrant. Toss in panko, let the crumbs toast a bit. Remove to a bowl, grate parmesan on top, mix in. Return the pan to stove, add more olive oil and mashed garlic. Drain pasta, add to pan with olive oil and garlic. Toss to coat. 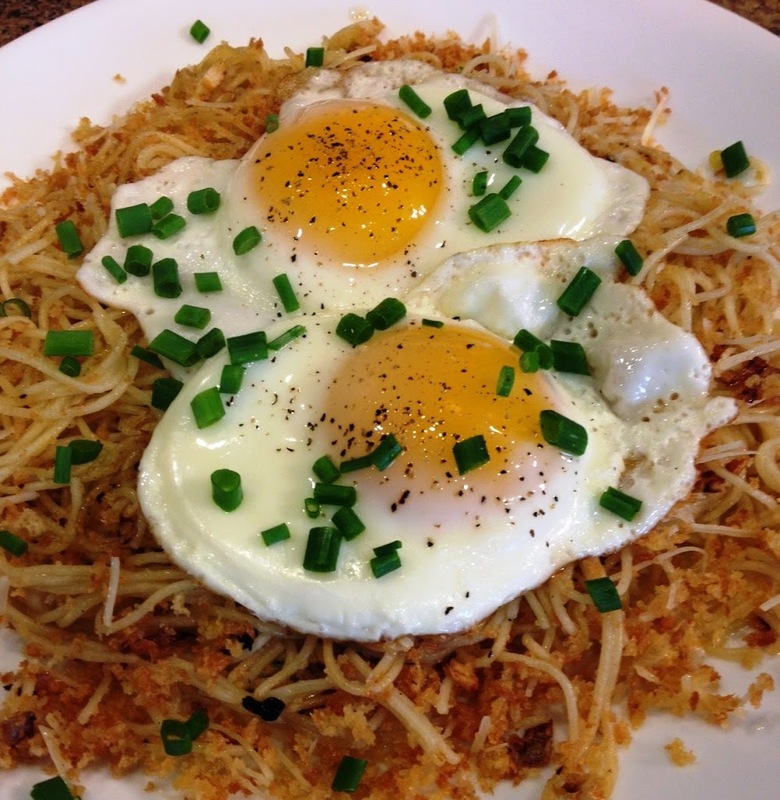 Place pasta on dish, toss with panko, and gently slide eggs on top. The instructions are basically the same for each and only vary with the difference in toppings. Preheat your grill in high, or set your oven’s broiler on high. Evenly spread the oil (or bacon grease) over the cut surface (not the crust). Spread garlic if the recipe calls for it. Prepare all fillings. If you didn’t cook the ground beef specifically for this recipe, warm it in a microwave oven in a skillet on the stove. (Do the same for the bacon.) Slice and chop all ingredients, and pre-measure the cheeses if needed. For the mushroom filling, preheat a nonstick skillet. Add a bit of cooking spray. Saute the onions and mushrooms until everything is softened the the mushrooms have released their water. 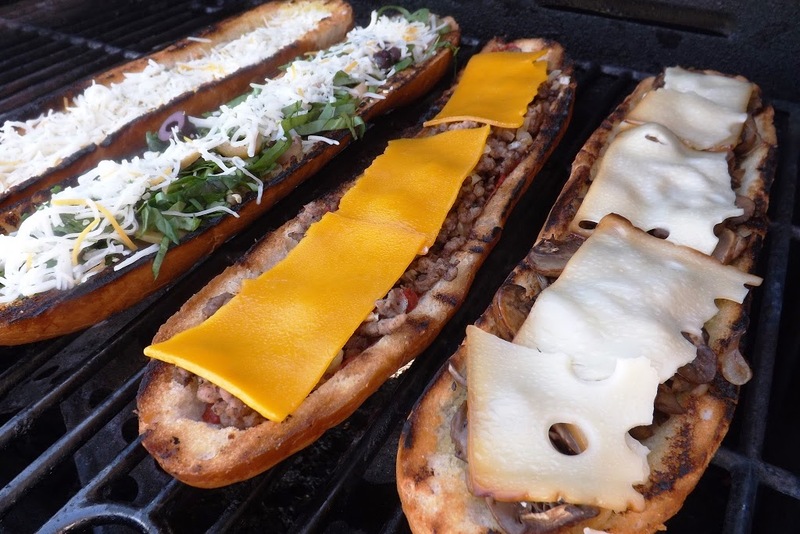 When all toppings are ready, take the bread to the grill. Turn the heat to low and lay them, cut side DOWN, on the grill. Don’t walk away. The crusts go from raw to crispy to burned with very little time in between those stages. (Mine were getting close to burnt!) This will take 1-2 minutes. 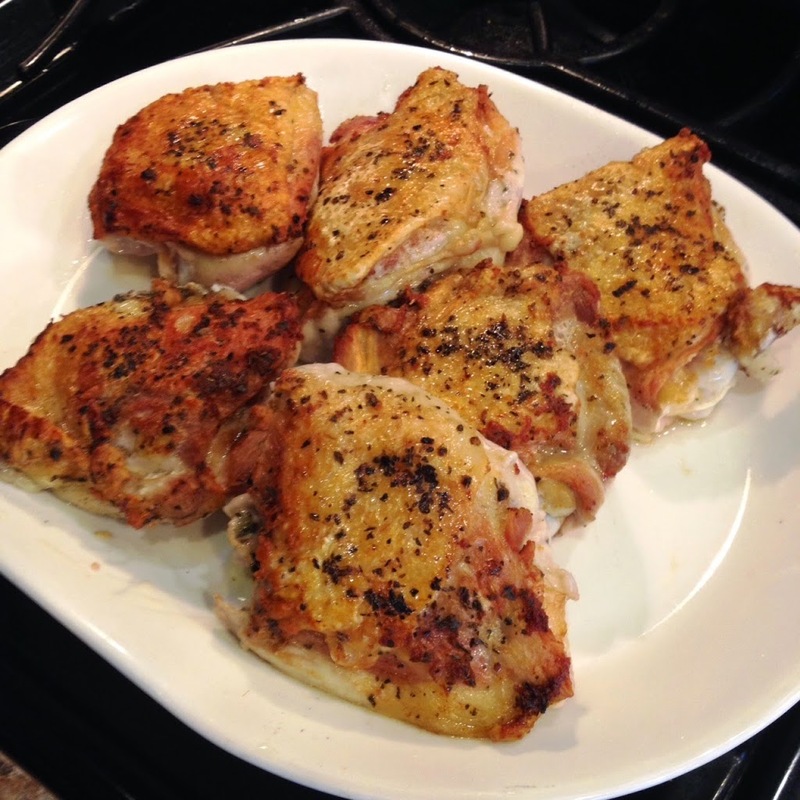 If you are using your broiler, place them cut side UP, and give them the same 1-2 minutes. The idea is to crisp the crust, and help it resist absorbing any juices from the fillings and getting soggy. Take the crusts back to your work area. 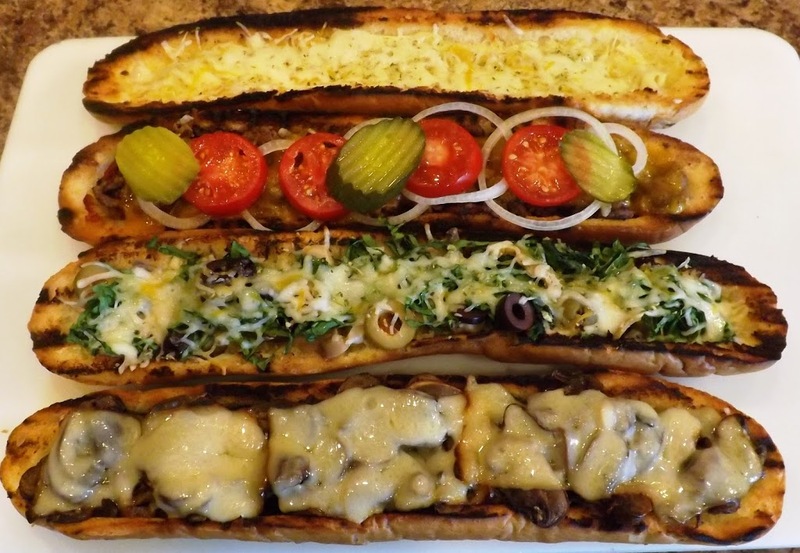 Fill the crusts in the order that they are given. Remove when the cheese is melted. Let rest briefly, then cut and serve. Note: This is my first attempt at these recipes, and I liked the crispy crust. At Tammy’s request, I will try these techniques again, but not toast the bread initially for a softer crust. I will also use some different fillings (yet to be decided.) I will post the results here, later this week. This holds about 12 ounces (360ml) and I think this is as small as you should buy. I wish that I had a larger one. We’ll see. I bought this at IKEA for about $10. It is heavy marble, and has a very smooth exterior and a slightly rough interior. The marble makes it very easy to clean. Peel and roughly chopped the garlic, and place it and the salt, and 1 teaspoon olive oil in mortar (and the optional ingredients if you are using them). 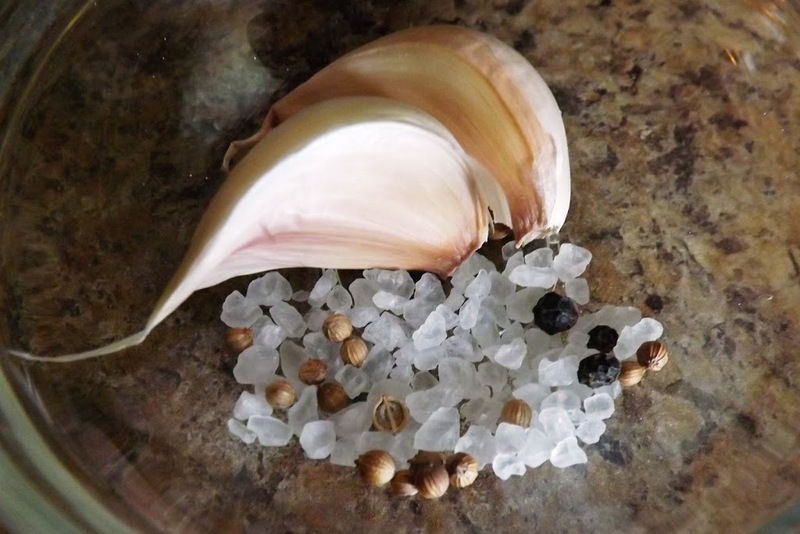 With the pestle light crush the garlic chunks a couple times with an up and down action. 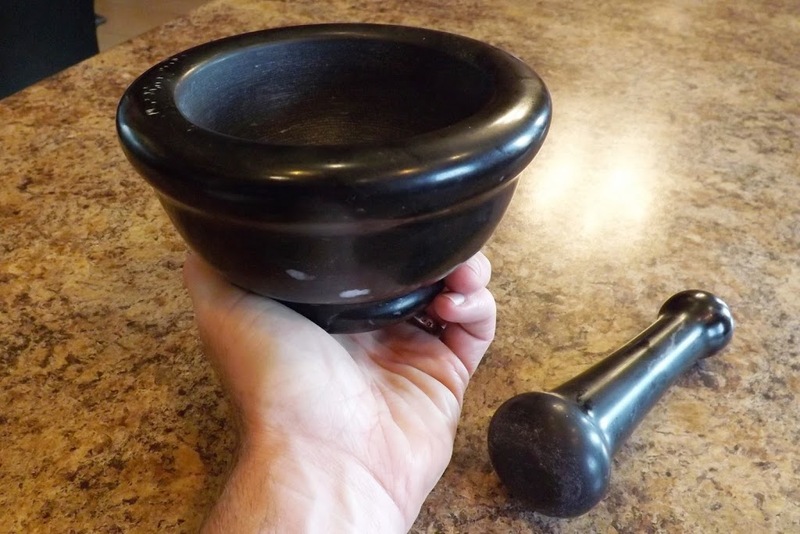 Then, holding the mortar tightly in one hand, grind the ingredients in a continuous circular motion, twisting it occasionally to pull the material under and between the mortar and pestle. After about a minute of grinding. Note: you need a mortar that holds at least 1 cup. If you can find one that holds 3 cups, it will be easier because the pestle will be larger with a larger grinding surface. 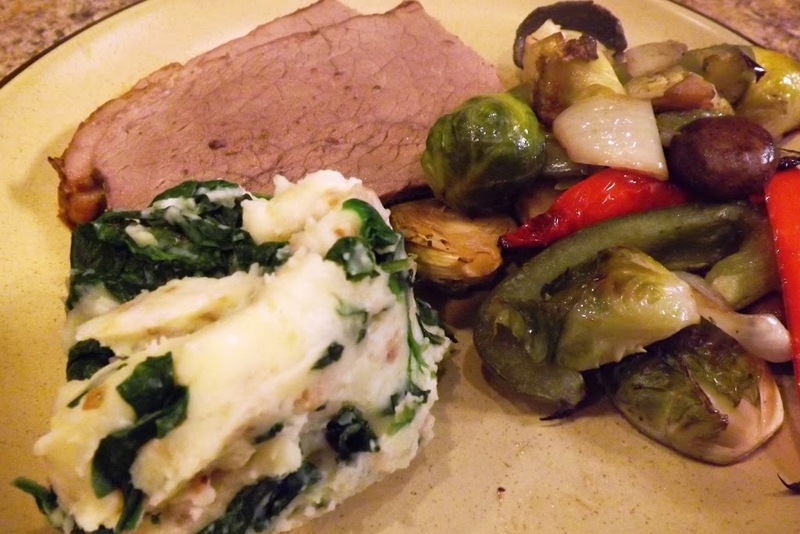 The goal is to mash the ingredients into a relatively uniform paste. The salt in here is necessary, because it acts as small grinding stones within the mash mixture. You also need a mortar that is light rough on the inside. I have seen some that were as smooth on the inside as on the outside. That would make grinding much more difficult because the roughness grabs the material and briefly holds it while you work out your day’s frustrations. The whole process will only take a couple minutes. Don’t forget to add the oil to your log. If you have three portions of meat, is is 40 calories of oil ,four portions is 30 calories of oil. This thin paste can be used on steaks of any sort, but I like using it on beef flank steaks, as they are relatively lean and benefit from having some added oil. I also use it on my pizza crust in place of a tomato sauce. 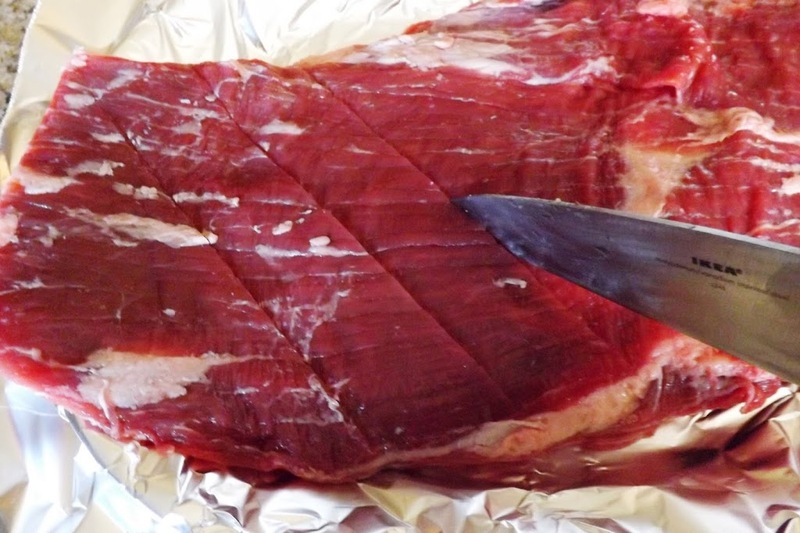 Preparing a flank steak takes a few additional steps. Do you see the muscle fibers running from the lower left corner to the upper right? 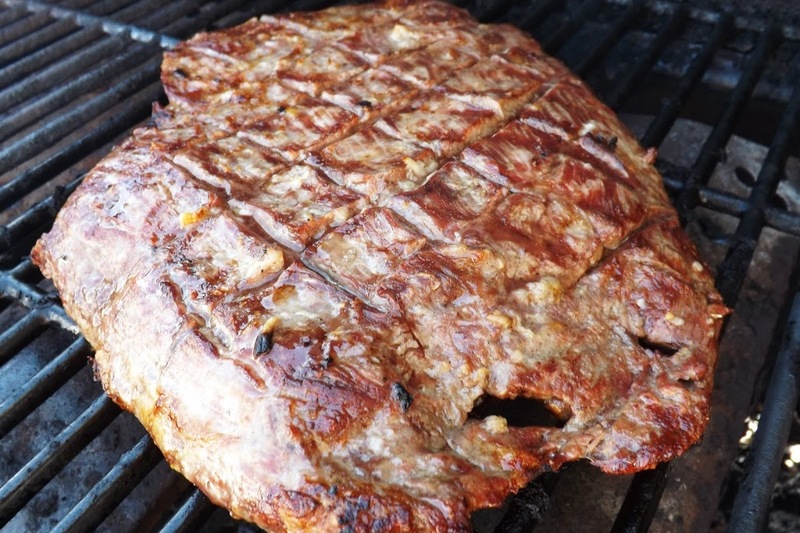 That is the “grain” of the meat, and when you serve a steak like this, you will slice it into 1/4 or 1/2 inch slices across the grain (moving the knife from upper left to lower right, in this picture) when you plate this meat for your dinner guests. 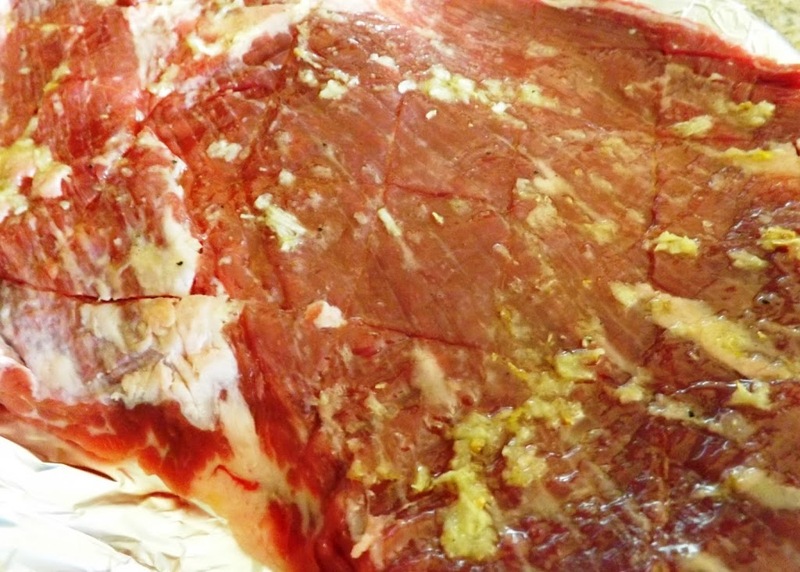 To help further tenderize the meat, before adding the garlic-oil paste, score the meat. Using a VERY sharp knife, cut a series of 1/4 slices into the meat, parallel and 1 inch apart, at about 45 degree to the grain. Then, cut it again, on the same side, but at right angles to the first cuts. Flip the steak over and repeat the process on the other side. 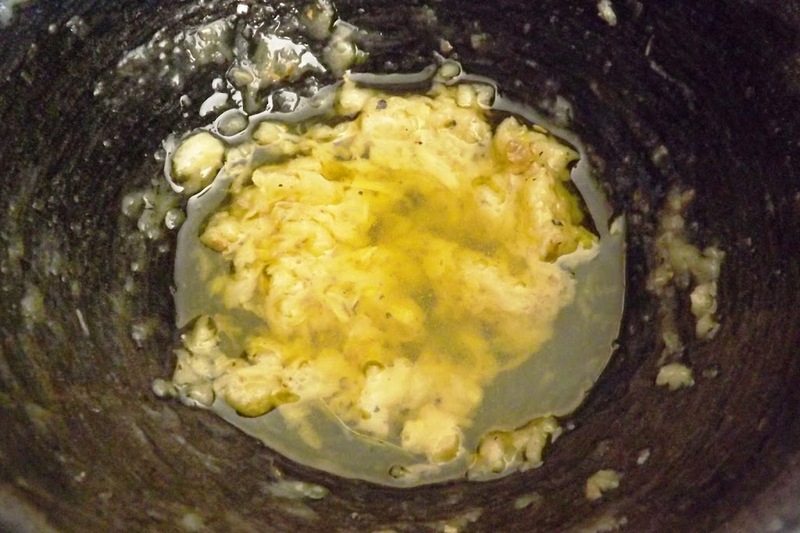 Then, rub the garlic-oil paste on both sides. At this point, you can pause our dinner prep. You could do all this even a day in advance. 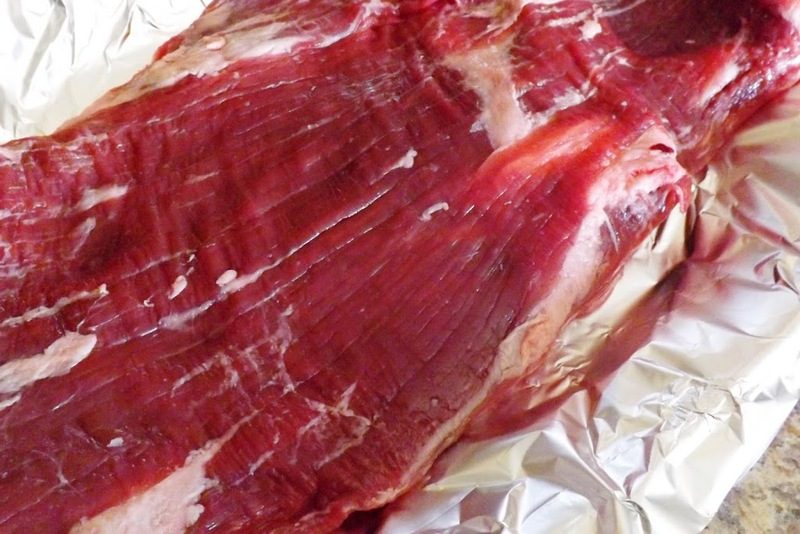 Just wrap the meat in plastic film and refrigerate, and it will be ready as soon as the grill is hot. Using an oil paste like this will help keep the steak juicy and tender. When ready to grill, preheat the grill on high for at least 5 minutes (gas grill) or let the charcoal burn down to gray embers. Brush the grates, and using tongs and paper towel, carefully rub vegetable oil on the grates to help prevent the meat from sticking. This steak cooks quickly. It is generally an inch thick at most, and when you criss-cross cut 1/4 inch on both sides, you open up a lot more cooking surface. (See how the heat opens the cuts?) About 4 minutes per side will be medium. Nutritional data? Depend on the size of the portion, and the exact cut of steak. The paste is enough to cover a 1.5 pound steak (above). I generally cut a flank steak into four ounce portions, so I can get about 6 servings per steak (many fewer if both of our boys are eating with us.) A four-ounce portion would have about 20 calories added from the oil. Poll results: 87% of respondents preferred the idea of a shorter ebook available sooner. An new poll will be out later today, to further refine that idea. THANK YOU for helping me with my next projects. I hope that you will be as satisfied with them as you are with this blog. Place potatoes in small pan, covered with water and bring to a boil. Boil until the potatoes are soft, and easily pierced with a fork (8-10 minutes–small dices cook faster). While the potatoes cook, heat a large (10-12 inch) non-stick skillet over medium high heat with the olive oil. When the oil is hot, add the garlic. Let it saute for 1 minute, then add the spinach. Turn the spinach frequently. It is finished when it wilts completely. Remove from the heat. When the potatoes of cooked, drain and place potatoes in a deep bowl. With an electric mixer, whip the potatoes. Add the yogurt and bacon bits. Mix well. Stir in the spinach and serve. Wash all veggies, and lay in a 9×13 pan. Drizzle 3 tablespoons olive oil evenly. Sprinkle with your favorite herbs and spices. Roast at 450 for about 30 minutes, stirring every 10 minutes. Nutritional data will vary with your veggies choices. Other options include adding baby carrots, zucchini, butternut squash cubes, potato cubes, cherry tomatoes, whole garlic cloves. 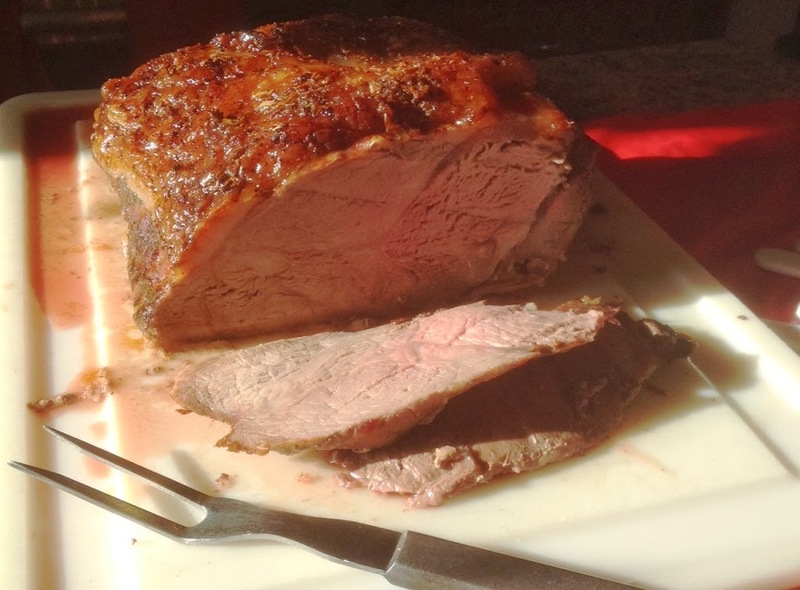 Let the roast rest at room temperature for 1-2 hours. Season it as you prefer. Place the roast in a pan. Bake uncovered, 30 minutes per pound (for medium) or until an instant read thermometer reads 150. Take it out of the oven, and cover loosely with foil. The roast will continue to cook for another 15-20 minutes. 1. Combine all in a food processor. Process until well mixed. The cilantro will be coarsely chopped. That’s it. How simple is that? Serve on fish, chicken, vegetables, pork, eggs–just about anything! You can make this spicier by using more jalapeno or different chiles, such as a serrano or habanero. 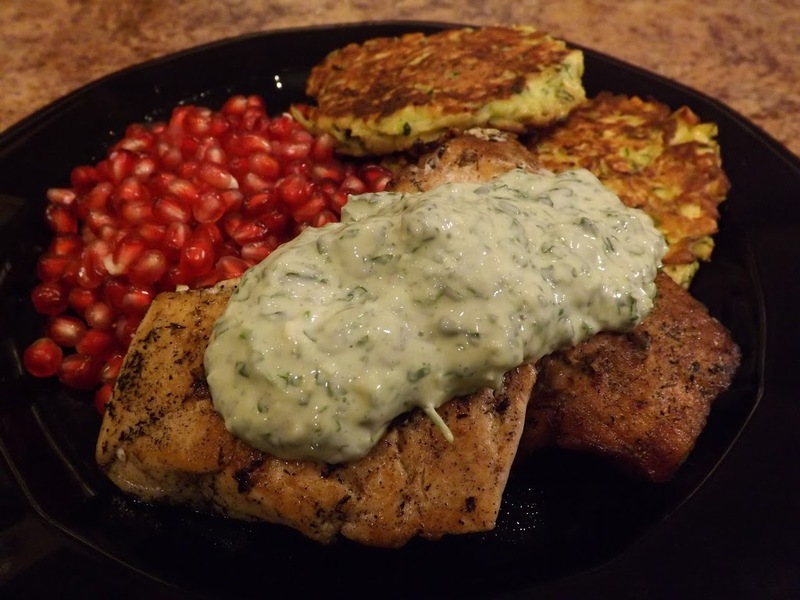 This is how I used it last night, on grilled salmon, zucchini-potato pancakes and fresh pomegranate.